Our skills, systems and services drive the results you need. We built aiFAB as a resource for customers of Aluminium Industries and designed it to maximise efficiency. A one-stop shop for digital fabrication, we offer customised machining and assembly arrangements to suit you. AiFAB can help with a big project, a surge in production, a streamlined business model, or savings on labour and investment in machinery. The more we handle for you, the more cost-benefit you’ll see. By housing finishing, machining, assembly, packing and distribution under one roof, efficiencies are gained, and time and money are saved. AiFAB maintains a wide array of advanced machinery and precision tooling options. From massive sections for the transportation industry to complex architectural elements and intricately interconnected shelving systems, we’re the experts. 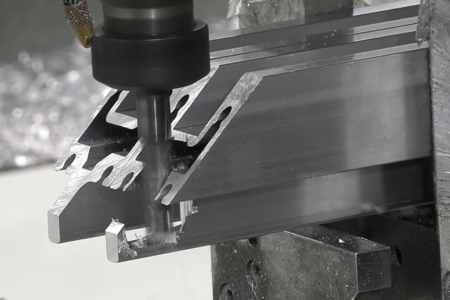 Our fleet of CNC machines are capable of handling extrusion lengths up to 16.4m. We have 90-degree repetition cutting saws, double-headed and single-headed mitre saws, and plenty of options for drilling, punching and cutting aluminium. To visit our site and learn how our advanced digital fabrication techniques can help you, call aiFAB and ask to speak to one of our team members. AiFAB has provided machining, fabricating and assembling services for customers of Aluminium Industries since 2009. Our assembly teams take great pride in satisfying the highest standards of finished product. Our people have extensive experience in manufacturing and assembly with transportation, automotive and architectural products. We confidently fabricate aluminium products for all types of applications, in Australia and around the world. Our complete service approach allows us to be flexible with custom requirements. We can machine, finish and assemble a product in the appropriate order for the desired result. Save the costs related to hiring and training fabrication staff. We handle the labour required to assemble your product, creating savings for you. Talk to us to visit the premises and see our range of capabilities. Capable of machining up to 16.4m lengths, the Titan CNC machines allow FAB to take on projects of great length. Offers 5-axis machining for rapid completion of complex jobs. Pinion, rack and mechanical systems ensure backlash recovery. 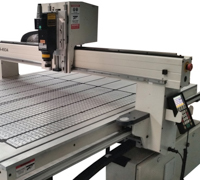 The 15m Multicam CNC flatbed router handles procedures such as routing (milling), drilling, boring, engraving and modelling with ease. High RPM spindles offer excellent edge quality with smaller-diameter cutting tools. The 9m Pegasus 5-axis is designed for milling, drilling, threading and cutting on bars or pieces of aluminium, PVC, light alloys and steel. Capable of machining all angular inclinations, and delivers excellent finishing, even on heavy machining. A streamlined version of the Pegasus, the Italmac Spring 4-axis CNC is designed for milling, drilling, threading and cutting aluminium, PVC, steel and light alloys. Our 4m Minis are efficient 3-axis machines, perfect for manufacturing doors and other industrial applications with a minimum of complication.